A Private Japanese Collection of Early Ceramics. Photo: Sotheby’s. HONG KONG.- Sotheby’s Hong Kong presents the November and December sale series of Chinese art, timepieces, jewellery and wine at Sotheby’s Hong Kong Gallery, starting with two sales of Chinese Art to take place on 24 and 25 November. 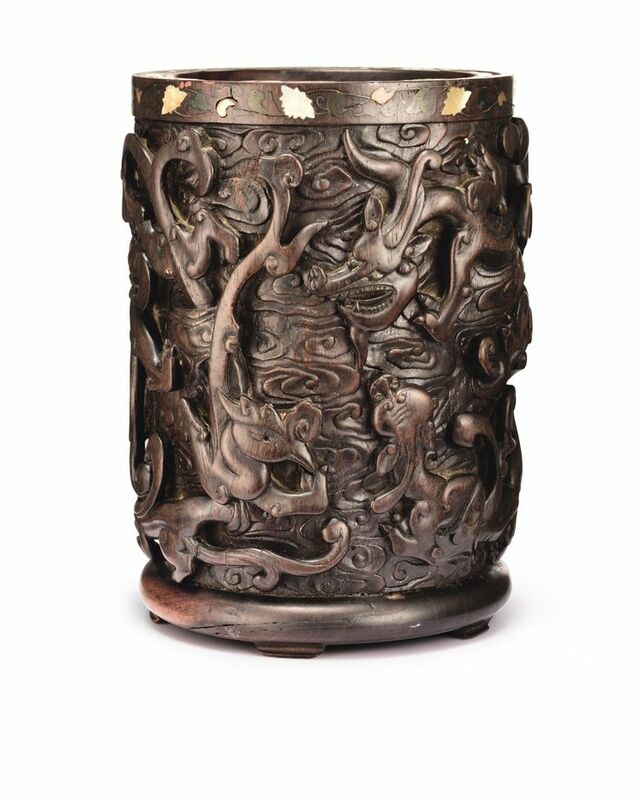 Comprising highlights in Chinese Art as well as snuff bottles from the legendary Mary and George Bloch Collection, the two sales will offer a total of 553 lots, with a total estimate of over HK$46.3 million / US$5.9 million*. This sale features a superb group of carved brushpots from an Asian private collector, ranking among the finest examples to have emerged on the international market in recent years, a fine collection of Chinese works of art including Song and Yuan ceramics gathered over a period of 30 years in Japan, a collection of Qing dynasty glass, comprising pieces acquired in Sotheby’s London in 1979, from the celebrated Plesch collection, together with jade carvings from an old Hong Kong family collection. Xiao Tang Ji is a fine collection of brushpots and playthings for the scholar’s desk belonging to Xiao Tang, a renowned Asian designer who shares deep passion for the Chinese literati culture. 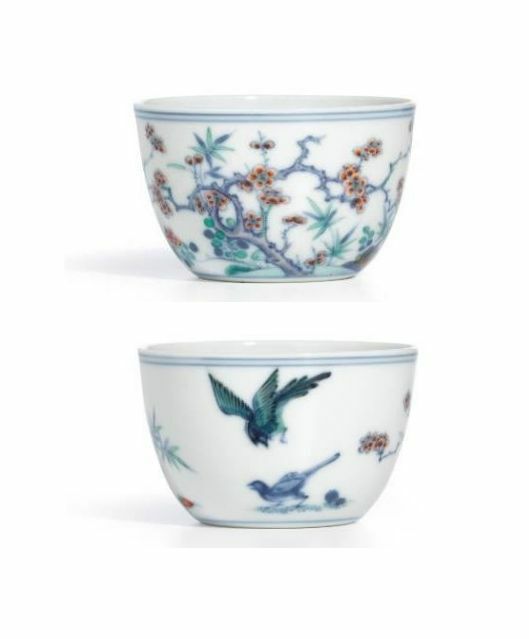 This collection includes some outstanding brushpots including two examples inscribed by the renowned 18th-century painters Luo Pin and Jin Nong, both part of the so called group of the ‘Eccentrics of Yangzhou’. Through his multi-faceted interests, Xiao Tang is perpetuating in the 21st century this scholarly tradition of non-conformism and creativity, ultimately nurtured in classical studies. This brushpot is striking for its elegant design of a flowering prunus, which follows the tradition of Chinese painting with the surface of the huanghuali – a favoured motif symbolising perseverance, purity and old age – treated as a horizontal handscroll. The carver has further enhanced the overall pictorial effect by skilfully incising lines of differing depths, as seen in the broad cuts that define the gnarled tree and the thinly engraved plum blossoms. The brushpot was an essential item for the scholar’s desk, offering not only a utilitarian vessel but also a source of inspiration for reflection through its carved subject. Known as one of the ‘Eight Eccentrics of Yangzhou’, Jin Nong (1687-1763) established himself as a talented poet, calligrapher and painter and a connoisseur of ancient bronzes and stone inscriptions. He is particularly noted for developing the ‘lacquer script’ (qishu), which evolved from inscriptions on Han dynasty (205 BC-220 AD) lacquer vessels made with a brush with the tip cut away. An Exceptional Huanghuali ‘Prunus’ Brushpot Inscribed By Jin Nong (1687-1763) Qing Dynasty, 18th Century. Estimate Est. HK$1.6 – 2.5 million / US$207,000 – 323,000. Photo: Sotheby’s. of circular form and supported on six short feet, deftly carved with branches issuing prunus buds and blossoms elegantly extending across the exterior of the brushpot, the surface further incised with three aptly interspersed inscriptions, one translating to ‘A Picture of River Prunus Blossoms by an Old Sojourner Dragon Spindle with New Comments in His Own Words’ and followed by seal reading jin jijin yin, another inscription signed by Dongxin xiansheng (‘Winter Heart Old Fellow’) and followed by two seals reading shou and menrespectively (‘Gate to longevity’) and a further seal reading Dongxin xiansheng, adjacent to two further incised collector seals reading Gushi wenfang (‘Study of Mr. Gu’) and cang yu helu (‘Kept as a treasure at Crane Hut’), the wood of a warm brown colour; 24 cm., 9 1/2 in. PROVENANCE: Collection of Gu Linshi (1865-1930) (Guoyun Lo). Notes: This brushpot is striking for its elegant design of a flowering prunus, which follows the tradition of Chinese painting with the surface of the huanghuali treated as a horizontal handscroll. The carver has further enhanced the overall pictorial effect by skilfully manipulating his blade as he would his brush and successfully captured texture by incising lines of differing depths, as seen in the broad cuts that define the gnarled tree and the thinly engraved plum blossoms. The brushpot was an essential item for the scholar’s desk, offering not only a utilitarian vessel but also a source of inspiration for reflection through its carved subject. As the first flower to bloom each year, the flowering prunus was a particularly favoured motif amongst scholars as it symbolised perseverance, purity and old age. 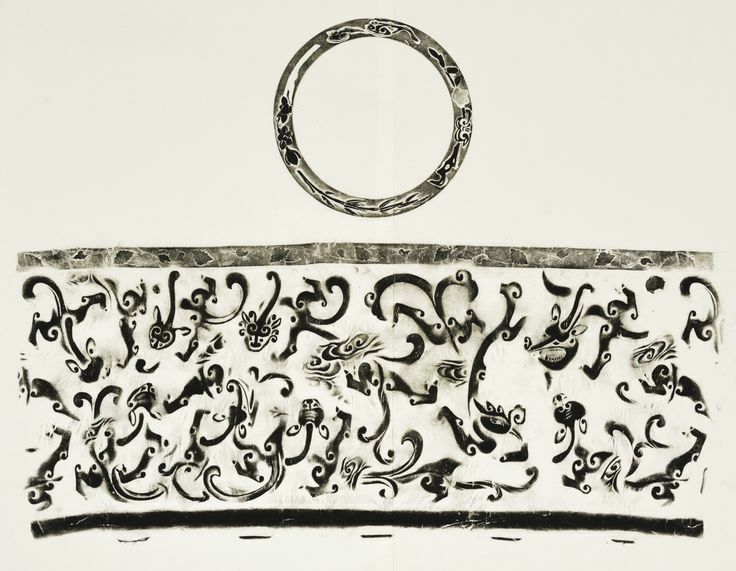 Zitan brushpots carved with this intricate design are rare, although a related example, similarly inlaid at the rim with a scrolling vine interspersed with creatures, from the Qing Court collection and still in Beijing, is published in The Complete Collection of Treasures of the Palace Museum. Bamboo, Wood, Ivory and Rhinoceros Horn Carvings, Shanghai, 2001, pl. 50, together with a zitan brushpot decorated with the same inlaid design at the rim, but carved with figures in a landscape, pl. 18. Compare also a brushpot carved with dragons and related inlaid scrolling rim, also in the Palace Museum, Beijing, illustrated in The Complete Collection of Chinese Art. Bamboo, Wood, Ivory and Rhino, vol. 11, Beijing, 1987, pl. 67, and a late Ming dynasty perfumier from the collection of Wang Shixian, illustrated in Bamboo Carving of China, China Institute in America, New York, 1983, cat. Figs. 12 & 12a p. 27. Born in Hangzhou, Jin Nong (1687-1763) moved to Yangzhou where he found extensive patronage and established himself as a talented poet, calligrapher and painter and a connoisseur of ancient bronzes and stone inscriptions. Identified as one of the ‘Eight Eccentrics of Yangzhou’, a group of idiosyncratic artists that excelled at flower paintings in the spontaneous xieyi(picture idea) style, he is particularly noted for developing the ‘lacquer script’ (qishu), which evolved from inscriptions on Han dynasty (205 BC-220 AD) lacquer vessels made with a brush with the tip cut away. The handscroll painting ‘Prunus blossom’ signed by Jin, included in the Oriental Ceramic Society exhibition Arts from the Scholar’s Studio, Fung Ping Shan Museum, Hong Kong, 1985, pl. 4, illustrates the close connection between his style of carving and painting. See also Jin’s painting of the same subject, in the Palace Museum, Beijing, and illustrated in Wang Zhihai, Collection of Yangzhou Calligraphy and Painting, vol.I, Tianjin, 1996, p. 124 (Fig. 1). Jin used many sobriquets, of which the ones that appear here are: Dongxin (‘Winter Heart’), Dongxin (‘Mr. Winter Heart’), Chichun weng (‘Old Fellow Brazen Spring’), and Longxu jiuke (‘Old Sojourner Dragon Spindle’). ‘As for marvelous prunus blossom painters, in Guangling [Yangzhou district] I found two such friends there, Wang Chaolin [Wang Shishen (1686-1759)],who paints lush boughs, and Gao Xitang [Gao Xiang (1688-1753)], who paints sparse boughs. Both are men who do not eat cooked food [i. e., they transcend the mundane world]. In painting this picture I am neither lush nor sparse but in between. People who see it might identify me with the tradition of Ding Yetang [bamboo and prunus painter, active ca. 1225], but this is merely to perceive the sour smell off your fingers [i.e., to have crude and superficial judgment]. Written by the Winter Heart Old Fellow’ with two seals: ‘Gate to Longevity’ and ‘Winter Heart Old Fellow’. ‘Here Old Fellow Brazen Spring has painted some wild prunus blossoms, branches replete with countless blossoms thrusting upward and downward. They were blooming everywhere both north and south of my lodge, where the stones covered with moss are so very hard to sketch. The day was cold and about to snow. At water’s edge where a little storied pavilion is found, I could only see utterly cold birds soaring and swooping up and down, chirping about their fragrance and playing with their shadows, and no one in sight coming this way.’ followed by the additional comment ‘A Picture of River Prunus Blossoms by Old Sojourner Dragon Spindle with a New Comments in His Own Words.’ and signed with one seal (‘Seal of Jin Jijin’). 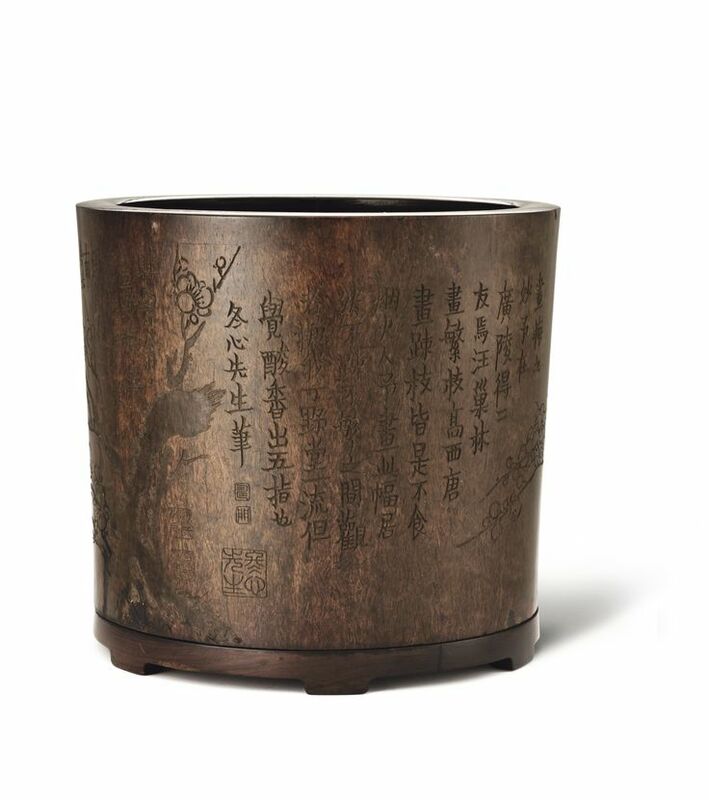 This brushpot was part of the collection of Gu Linshi (1865-1930), as attested by a further inscription which reads ‘Brushpot by Jin Nong on which he inscribed a poem and sketched boughs of prunus blossoms’ and the two seals below branches: Gushi wenfang (‘Study of Mr. Gu’) and Zang yu Lelu (‘Kept as a treasure at Crane Hut’). A native of Yuanhe (district of Suzhou), Gu Linshi, sobriquets Xijin, Xijin sanren, Xijin yufu, Helu zhuren and studio name (shiming) Helu, was a famous collector of paintings and calligraphic works, as well as rare books, and himself a landscape painter. Jin Nong mastered a variety of calligraphic styles, which can be generally summarized into four types. One is ‘lacquer script’ (qishu). Instead of using the tip of the brush, Jin invented the style of writing with the side of it. Similarly like using a lacquer brush, horizontal strokes now became bold where vertical strokes turned into slim. Perfectly controlling the spacing relationship between the characters and the plain background (liubai), a delightful yet archaistic piece of master calligraphy can be obtained. Another is ‘clerical script’ (lishu). Inspired by the stele inscriptions Xia Cheng and Huashan Miao, the characters became more compressed in general. During the writing process, the tip of the brush was being avoided, and the brush was being carefully controlled with a great deal of steadiness. The calligraphy will thus spark a sense of archaism which can reflect back to the glorified and mysterious Chinese bronze inscriptions. The third style is ‘small regular script’ (xiaokai). Writing with a heavily inked brush, the characters were well organized and arranged. This style well reflected a sense of naturalism. The content normally contained an inscription or a poem written by him. The famous painting master Qi Baishi practiced this style in his early years and achieved at a level where his writing was almost indistinguishable to the real work. The last style resides in between the regular script and the clerical script. Referenced from the stele inscriptions of the Wei dynasty (220-226), the characters were more plumped and angular in a squared fashion. It was to be said ‘dull yet beautiful, heavy yet ingenious’. The content usually contained a biography or an article of the personage of the past. The inscription of the current brushpot would reflect this last style. Zitan brushpots carved with this intricate and dynamic design featuring the dragon chilong are rare. Deftly carved with a complex web of interlocking sinuous chilong and a confronting dragon and phoenix on one side, this brushpot is a fine example of the bold creativity attained by artists working during the 17th century. The composition of the brushpot would have to be conceived in its entirety to ensure the space was harmoniously filled while allowing the scene to unfold with every turn. Furthermore, it is particularly notable for the bodies of the creatures that are rendered in openwork and high-relief carving, which heighten the sense of movement and three-dimensionality, set against a ground of low-relief swirling clouds. The fine and dense grain of the precious zitan wood has enabled the carver to successfully capture the scene, while the inlaid foliate scroll at the rim heightens its luxuriousness. An Exceptional Carved Zitan ‘Dragon And Phoenix’ Brushpot Qing Dynasty, 17th Century. Estimate HK$1.2 – 1.8 million / US$155,000 – 233,000. Photo: Sotheby’s. of cylindrical form raised on an associated rounded base supported on five feet, masterfully carved in openwork and high relief with a complex web of interlocking sinuous chilong and a confronting dragon and phoenix on one side, all against a ground of low-relief swirling clouds, the rim embellished with a floral scroll in hardstones and mother-of-pearl, the eyes of the dragons occasionally inset with metal, the densely grained wood richly patinated to a deep reddish brown colour; 17 cm., 6 3/4 in. 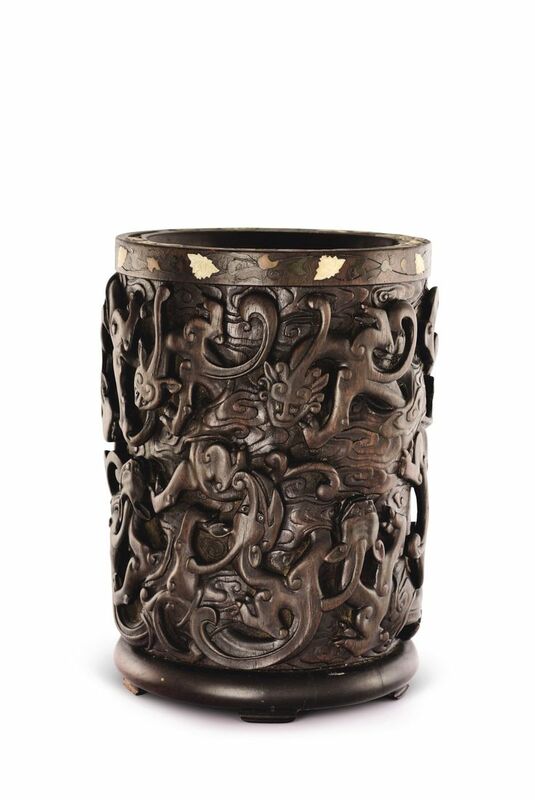 Notes: Deftly carved with a complex web of interlocking sinuous chilong and a confronting dragon and phoenix on one side, this brushpot is a fine example of the bold creativity attained by artists working during the 17th century. Although thechilong seen on this piece are well-known from jade carving and have been inspired by archaism, it is unusual to find them on brushpots in such a dynamic design. The composition of the brushpot would have had to have been conceived in its entirety to ensure the space was harmoniously filled while allowing the scene to unfold with every turn. Furthermore, it is particularly notable for the bodies of the creatures that are rendered in openwork and high-relief carving, which heighten the sense of movement and three-dimensionality, set against a ground of low-relief swirling clouds. The fine and dense grain of the precious zitan wood has enabled the carver to successfully capture the scene, while the inlaid foliate scroll at the rim heightens its luxuriousness. A Huanghuali Brushpot Inscribed By Luo Pin (1733-1799) Qing Dynasty, 18th Century, Dated To The Bingzi Year (1756). 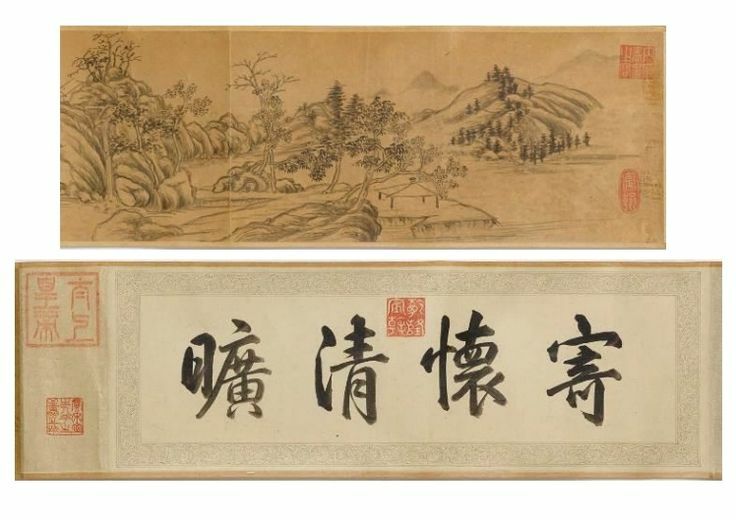 Estimate HK$250,000 – 350,000 / US$32,300 – 45,200.
carved with a simple blossoming prunus branch extending on one side and a couplet in cursive script, dated Bingzi jiu qiu (in accordance with 24 September – 23 October 1756) and signed Liangfeng (‘Double Peaks’), the densely grained wood richly patinated to a dark reddish brown colour; 16 cm., 6 1/4 in. Dated to the Autumn of the 9th month of the bingzi year (24th September-23rd October 1756). Notes: This beautiful brushpot bears the calligraphy of Luo Pin (1733-1799), zi Dunfu, hao Liangfeng, who was later known as Hua si zhi seng (Monk of the temple of flowers). A native of Yangzhou in Jiangsu province, Luo excelled in flower, figure and landscape paintings as well as calligraphy. He studied under the famous artist Jin Nong (1687-1763), together with whom he is celebrated as one of the Eight Eccentrics of Yangzhou (Yangzhou baguai), a group of artist painters that rejected the orthodox school of painting in favour of a style that was individualistic and expressive. 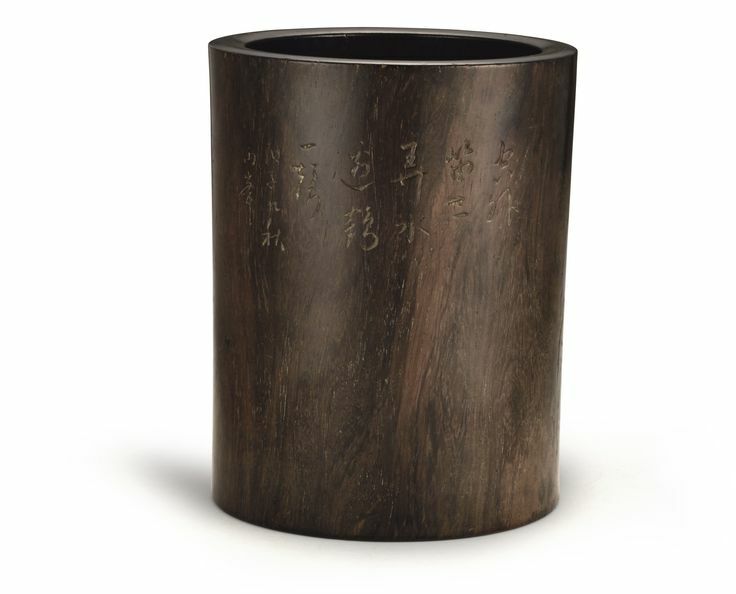 See a brushpot inscribed by Luo Pin, sold at Christie’s New York, 16th September 1998, lot 48. Ceramics range from HK$30,000 – 350,000 / US$3,900 – 45,200. A selection from a Japanese collection of Qing dynasty glass. Photo: Sotheby’s. 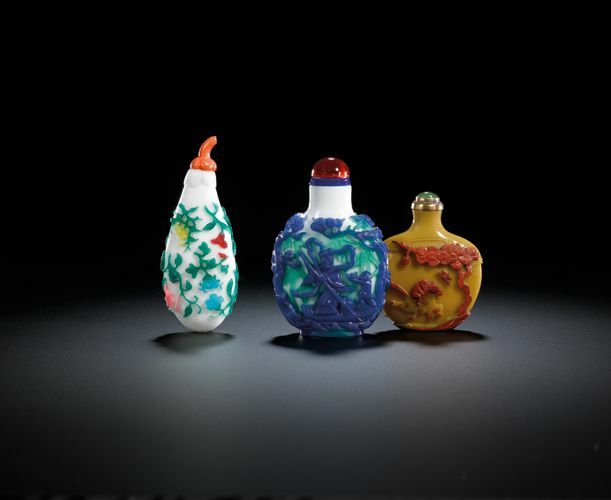 The ninth instalment of Snuff Bottles from the Mary and George Bloch Collection consists of close to 200 lots of snuff bottles in different media, reflecting the rich diversity and artistry of Qing dynasty craftsmanship. 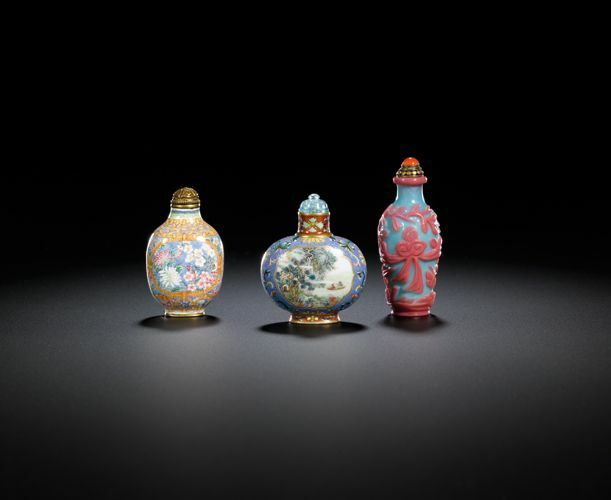 Originally numbering over 1,700 bottles, the Bloch Collection is legendary and counts among the finest Chinese snuff bottles ever made for the Imperial court and scholarly elite. It has been extensively published and exhibited at international institutions including the British Museum and the Hong Kong Museum of Art. 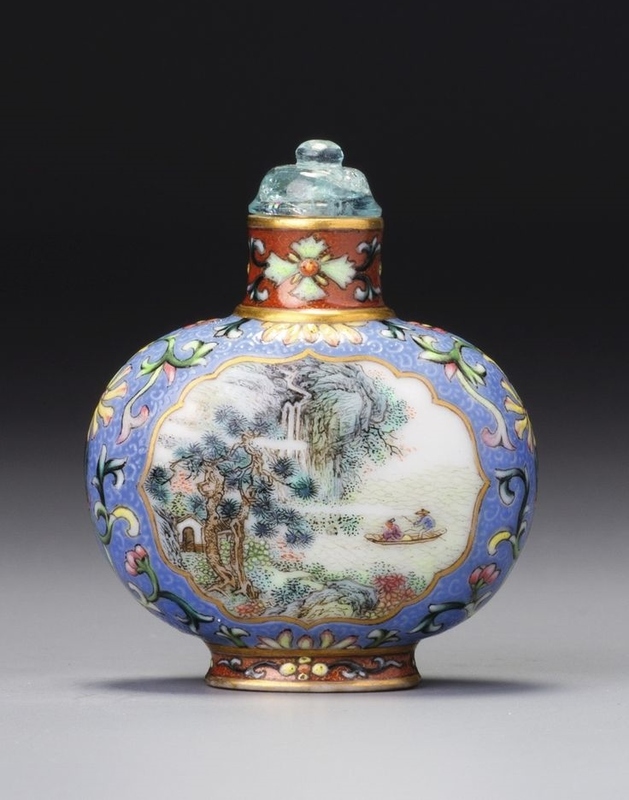 The highlight of the auction is an outstanding Qianlong mark and period famille-rose porcelain snuff bottle produced under the supervision of Tang Ying at the Imperial kilns of Jingdezhen, enamelled on one side with a wondrous landscape scene, the reverse with a poem by the Qianlong Emperor. The auction also includes an exceptional group of inside-painted bottles by Ding Erzhong, the greatest of late Qing dynasty snuff bottle artists. This is undoubtedly the finest and rarest of all the porcelain snuff bottles in the Bloch Collection. Commissioned as one of a pair in the early Qianlong period under the direct supervision of Tang Ying, the superintendent of the imperial kilns at Jingdezhen, it is remarkable for the quality of the enamels and the intricate engraving on the ground, that skilfully reveals the white underlayer, providing a stronger contrast for the brilliant and richly coloured enamel decoration. The Qianlong Chen Han seal on the poem is extremely rare on porcelain snuff bottles, and elevates the bottle to the same level as the finest famille-rose porcelain vases produced in the early Qianlong period. Hugh Moss (HK) Ltd., 1996. LITERATURE: Lindsey Hall, ‘Trompe L’Oeil and Chinese Snuff Bottles – Part Two: An Examination of Porcelain Imitations’,Journal of the International Chinese Snuff Bottle Society, Autumn 1998, p. 8. fig. 20. Hugh Moss, Victor Graham and Ka Bo Tsang, A Treasury of Chinese Snuff Bottles: The Mary and George Bloch Collection, vol. 6, Hong Kong, 2007, no. 1150. 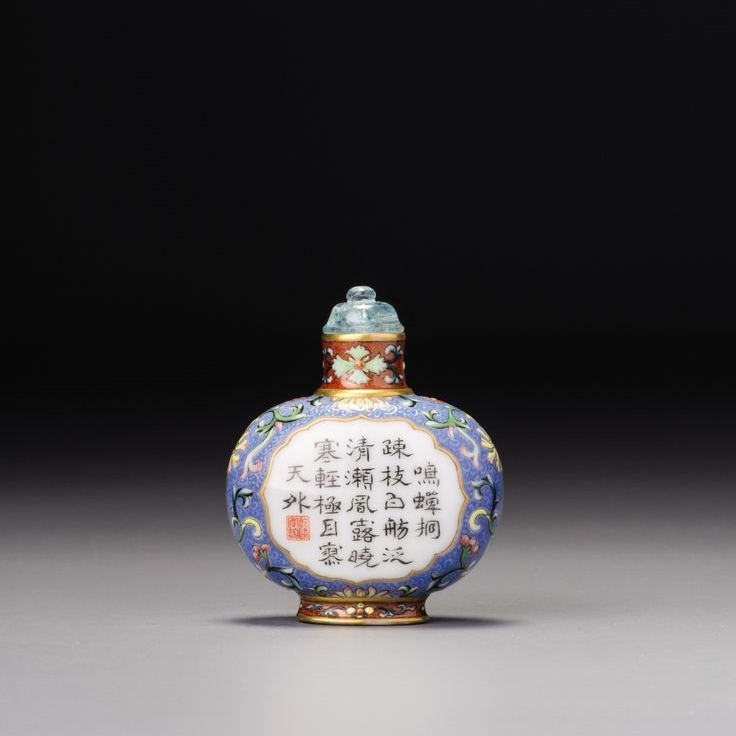 Notes: This is one of a pair of identical bottles from a single source (the other is in a private collection in Hong Kong), not unusual in imperial ceramic production. They are in extraordinary condition, with only the slightest evidence of having been used, and one may assume that they remained protected in the imperial collection for long enough to become highly valued as collector’s items and placed beyond use. 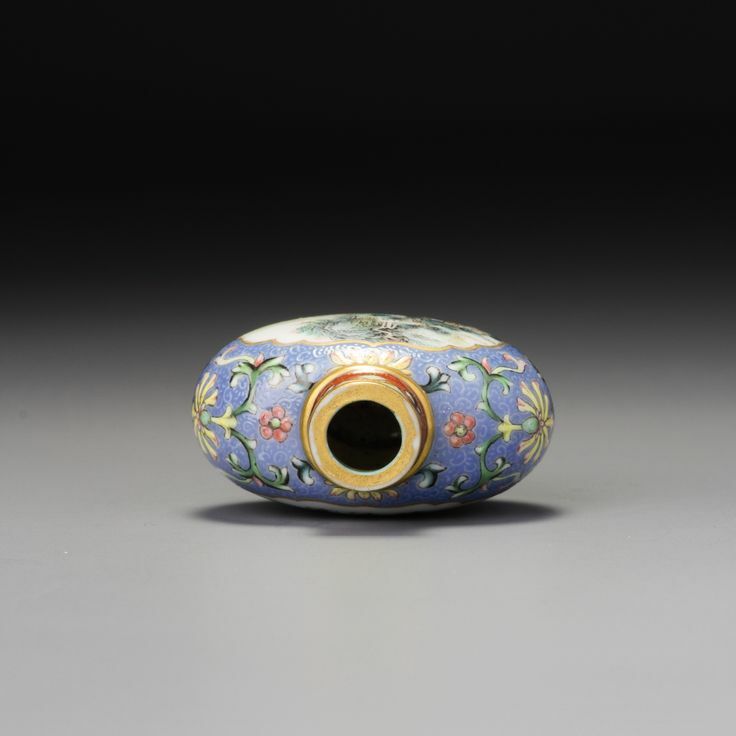 They represent the zenith of enamelling on porcelain in the snuff-bottle world and can be associated with Tang Ying, the supervisor of the imperial kilns during the early Qianlong period and probably the 1740s. They also introduce a new method of decorating with enamels: a monochrome enamel ground is engraved with a pattern that allows the white underlayer of enamel to show through and contribute to the design. This was apparently one of many innovations from Tang Ying’s superintendence of the imperial kilns. 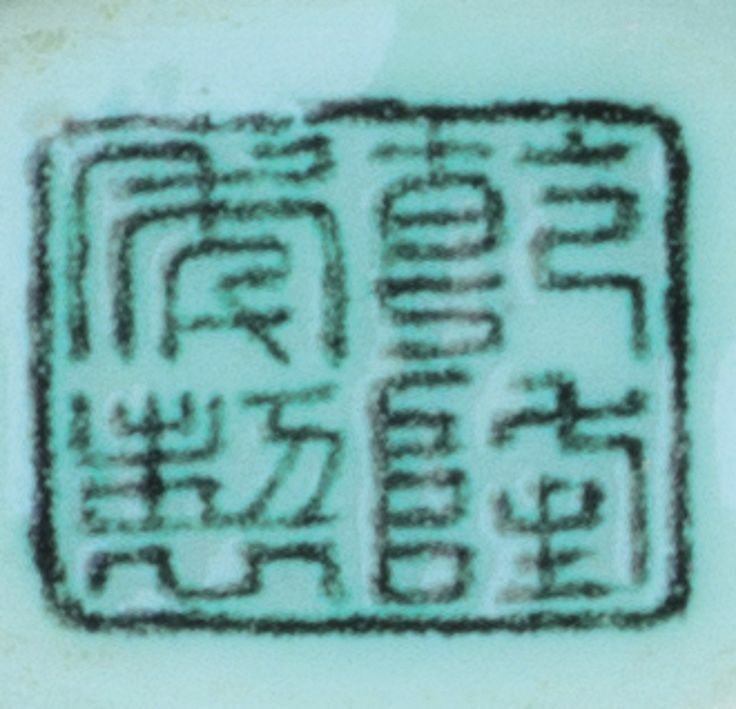 While it is true that the Qianlong chenhan seal is rare on snuff bottles, it does appear quite frequently on other ceramics produced for the emperor—some bearing his poems, and most associated with Tang Ying’s directorship of the imperial kilns.Qianlong chenhan appears four times on one piece in the imperial collection, albeit separated into two seals, one above the other, which the relative surplus of space allowed. Another pair of vases has the seals after an imperial poem written in 1736. The Qianlong chenhan seal can be associated with Jingdezhen production in 1742 and 1743. In private correspondence with Peter Lam, the archives show that six pairs of wall vases (sometimes referred to as ‘sedan-chair vases’ because they were sometimes hung on the wall of an enclosed sedan-chair to hold flowers) were ordered with imperial poems and this seal. One is in the National Palace Museum. Crying cicadas clutch the sparse branches. A white boat sails leisurely on the clear rapids. The wind and dew, with morning, are chill and light. I stretch my gaze beyond the empty sky. • An Inside-Painted Glass ‘Cranes and Landscape’ Snuff Bottle, Ding Erzhong, 1896; 5.7cm. Est. HK$240,000 – 280,000 / US$31,000 – 36,000. • An Inside-Painted Glass ‘Lakeside Landscape’ Snuff Bottle, Ding Erzhong, 1897; 6.7cm. Est. HK$240,000 – 280,000 / US$31,000 – 36,000. 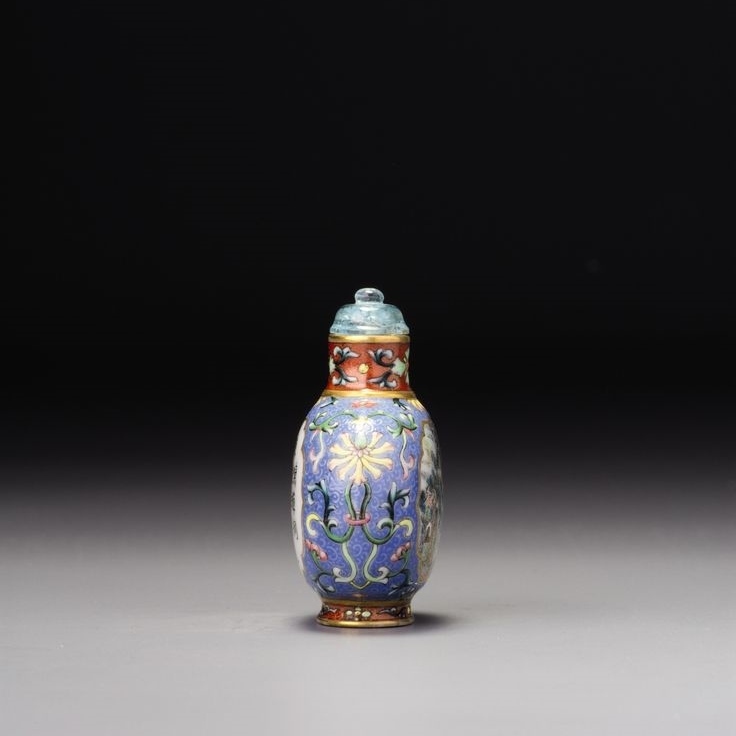 • An Inside-Painted Glass ‘Nine Likenesses’ Snuff Bottle, Ding Erzhong, 1904; 6.4cm. Est. HK$250,000 – 280,000 / US$32,000 – 36,000. 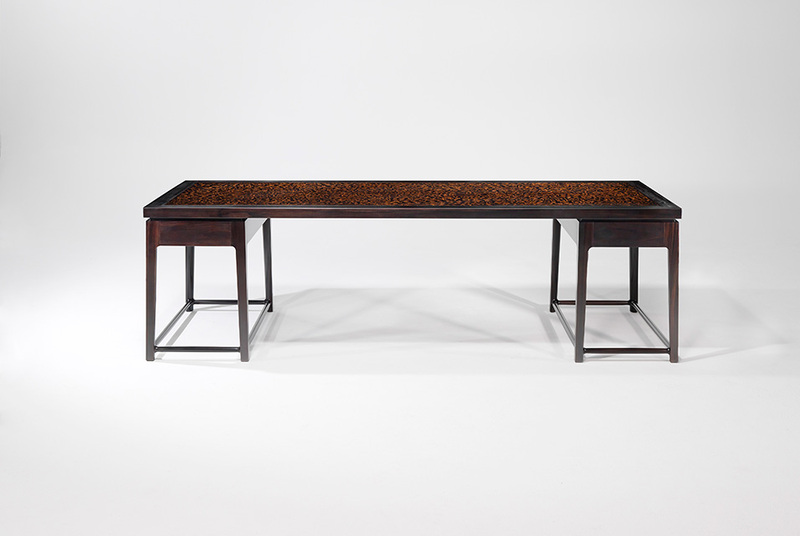 An Exceptionally Large ‘Bo Luo’ Lacquered Zitan Desk, Shang Xia / 2014, 248 x 96 x 73cm. Estimate: RMB 3,500,000-4,000,000 US$ 570,000 – 650,000. Photo: Christie’s Images Ltd 2014. SHANGHAI.- Following a successful touring of private sales, exhibitions and previews in Paris, Hong Kong and New York, Christie’s announced an exciting new category, Chinese Contemporary Design, that will be officially launched at Shanghai 2014 autumn auction. Inspired by the historical beauty of 5,000 years of Chinese culture and craft, these modern design pieces represent a large range of furniture, ceramics, and works of art made from the finest of raw materials such as porcelain ‘as light and delicate as an eggshell’, precious and rare woods such as zitan and huanghuali, Chinese traditional natural lacquer, silk from Suzhou, bamboo from Sichuan and white Hetian jade from Xinjiang. Some lost techniques are being revived here such as the application of gold powder on natural bamboo. 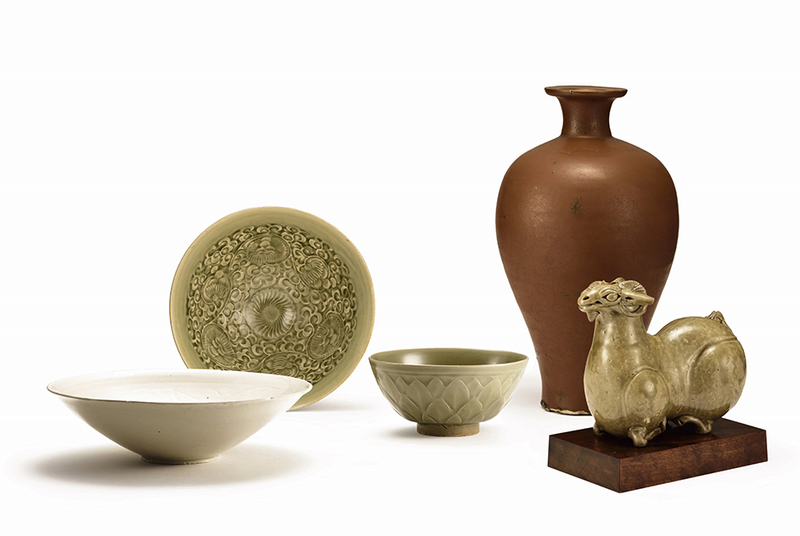 Twenty unique pieces designed by Shang Xia will be for the first time offered for sale during the Shanghai auction on October 24, 2014. 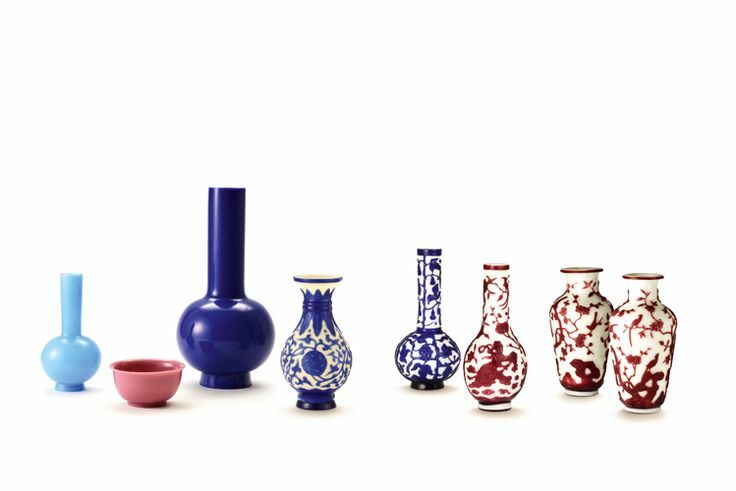 All have been produced in conjunction with local Chinese masters of their craft from different provinces who integrate the warmth, balance and harmony of Chinese grace into all the products and are designed to match the elegance of today’s modern aesthetic. 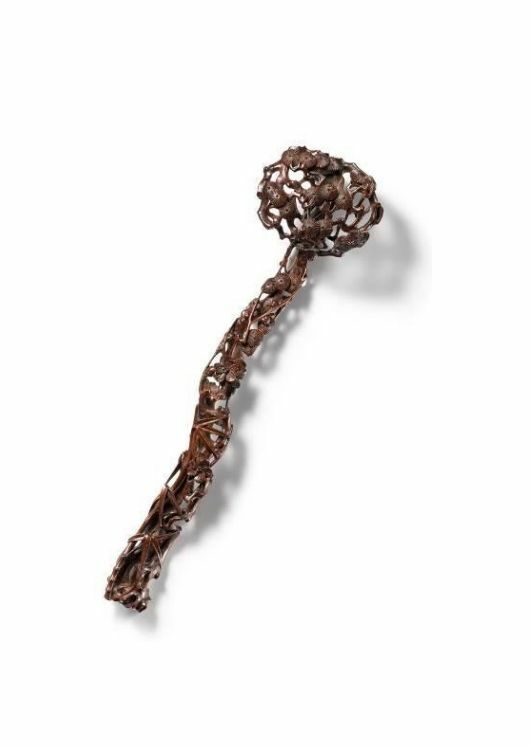 Each piece represents a continuous dialogue that transcends the past, the present and the future, as designers seek to preserve the skills of past Chinese artisans from the Song, Ming and Qing dynasties. Today, they try to pass these traditions on and push them to new limits, by incorporating innovative technical skills such as carbon fiber. 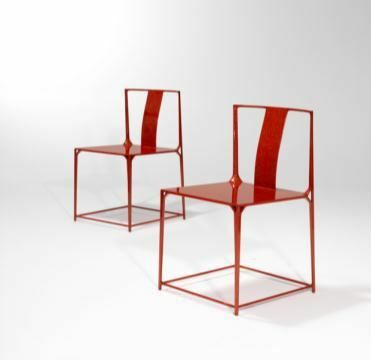 Shang Xia, « Big World », pineapple red paint on carbon fiber chair « up and down », 19 1/4 x 20 1/8 x 32 1/4 inch (49 x 51 x 82 centimeters). Estimate: RMB 600,000-650,000 US$ 98,000 – 106,000. Photo: Christie’s Images Ltd 2014. 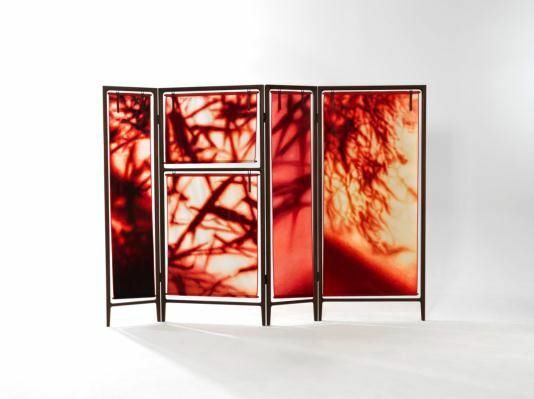 Shang Xia, « Gentleman », manual double-sided embroidery quadruple screen « up and down », 94 1/2 x 69 1/4 x 13 3/8 inches (240 x 176 x 34 centimeters) Estimate: RMB 800,000-1,200,000 US$ 130,000 – 196,000. Photo: Christie’s Images Ltd 2014. 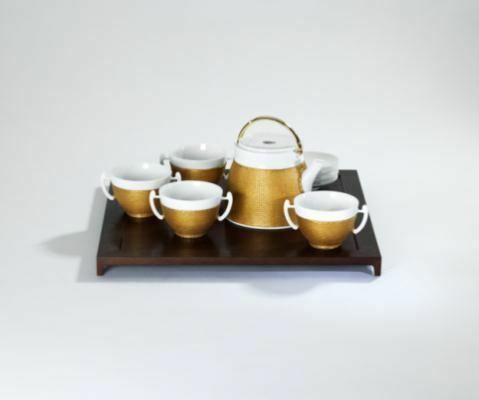 Shang Xia, « Dragon Dance », bamboo buckle gilt porcelain tea set « up and down », 97 5/8 x 37 3/4 x 28 3/4 inch (36 x 36 x 2 cm.). Estimate: RMB 320,000-350,000 US$ 52,000 – 57,000. Photo: Christie’s Images Ltd 2014. Provenance: Private British collection, acquired in Hong Kong in 1960s. Notes: It is suggested that furniture inlaid with burlwood, bamboo and archaistic jades, is typical of the Jiangsu style of court furniture. 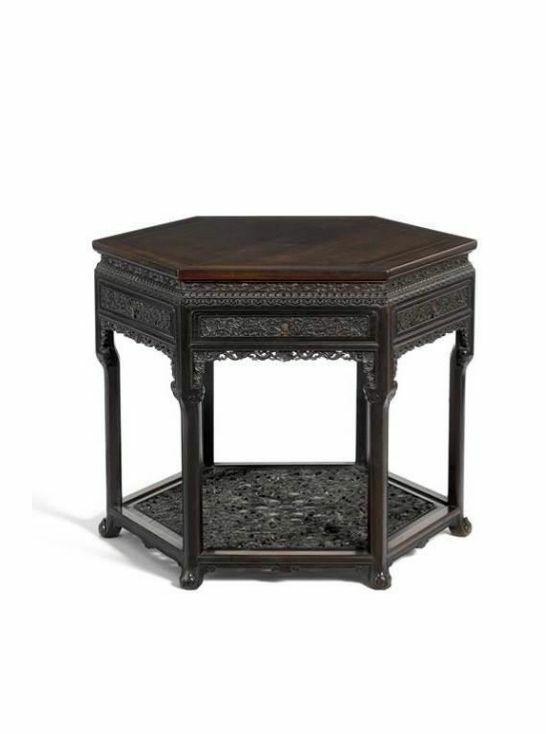 A similar zitan corner-leg table, dated to the mid-Qing period, and similarly decorated with a simulated rope-twist design linking jade discs is illustrated by Tian Jiaqing, Classic Chinese Furniture of the Qing Dynasty, Hong Kong, 1995, p. 176, no. 76. (Fig. 1) A related zitan table carved in openwork with the same rope-twist and bi-disc design along the narrow waist in the Qing Court Collection, and dated to the Qianlong period, is illustrated in The Complete Collection of Treasures of the Palace Museum, Furniture of the Ming and Qing Dynasties (II), Hong Kong, 2002, p. 104, no. 92. HONG KONG.- Sotheby’s Hong Kong will present Heirlooms of Chinese Art from the Hosokawa Clan at the Chinese Ceramics and Works of Art Autumn Sales on 8 October. Dating back to the 14th century, the Hosokawa clan has contributed many prominent figures to Japanese history and ranks among the most prestigious daimyo families. The sale presents an eclectic selection of outstanding porcelain, furniture, paintings and calligraphy, mostly focusing on the exquisite taste prevalent at the Qing court. Among the highlights are a meticulously decorated Qianlong celadon-glazed vase and a zitan hexagonal table intricately carved with Western-style floral scrolls made for the Imperial court. 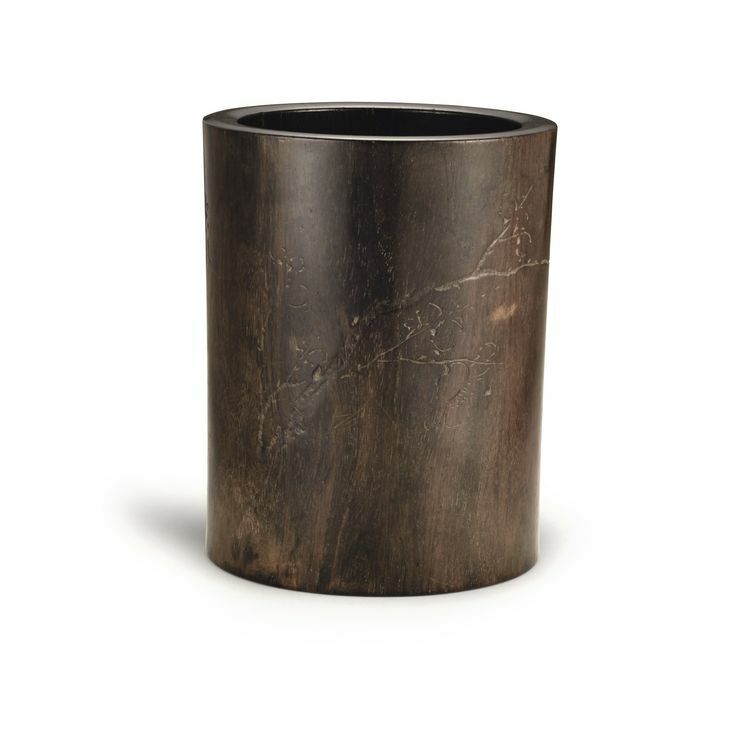 The sale will offer 30 objects, with a total estimate of over HK$38 million / US$4.9 million. The Hosokawa are a branch of the Seiwa Genji that trace their lineage back to Hosokawa Yoriari (1332 – 91), who fought alongside Ashikaga Takauji, and whose patriarch in early modern times was the powerful Sengoku-period daimyo Hosokawa Fujitaka (1534 – 1610). Fujitaka not only survived the constant warfare, but also found time for artistic pursuits—from waka poetry and the Noh theatre to the ancient tea ceremony. The family’s commitment to the arts and culture continues today. Amassed over 700 years, the Hosokawa collection range from manuscripts to handscrolls, books to paintings. A number of pieces are on display at the Eisei Bunko (Eisei Archive), founded in 1950 by Hosokawa Moritatsu (1883 – 1970), the 24th-generation head of the Hosokawa family. The works in the collection—the living heritage of generations of the Hosokawa family, plus Eastern artworks assiduously assembled by Mortitatsu himself—amount to some 80,000 pieces in total, including eight that have been designated as national treasures and 32 important cultural properties. These range from an impressive variety of arms, armour and historical documents, to items associated with the tea ceremony, Noh masks and costumes, ink paintings and calligraphy, illustrated albums of flora and fauna, as well as paintings in the Chinese style. All these speak eloquently of the spirit of balancing military and cultural accomplishments that runs in every generation of the Hosokawa family. While Ming dynasty furniture is characterised by the perfection of structure through sparsely-decorated designs, elaborate designs that merged European and Chinese forms and decorative motifs were intentionally chosen by the Qianlong Emperor in his desire to display imperial supremacy and grandeur. 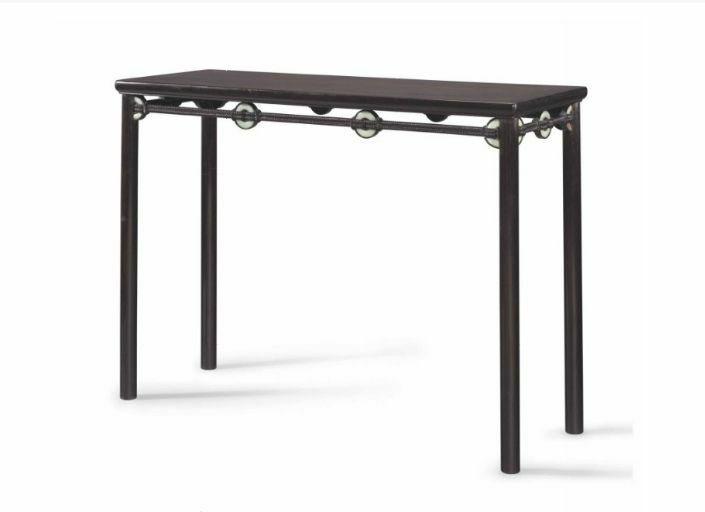 The importance of this table, likely employed as a games table, is indicated by the exotic zitan wood from which it is constructed. The most valued of all timber, zitan is characterised by its extremely fine and dense grain, which results in a pleasing heavy weight. The deep and subtle natural lustre is comparable to the texture of jade and develops with use; hence it is impossible to reproduce artificially. Its long growth period and limited availability in China made it particularly valuable and by the Qing dynasty measures were taken for its protection. Zitan tables decorated in this fusion of Chinese and European plant and styles are rare. The form of couch-beds can be traced back as early as the Han dynasty (206 BC-AD 220). Boldly carved with dramatic landscapes within frames fashioned to simulate bamboo trees, this grand couch-bed (luohanchuang) is an impressive display of furniture crafted in zitan which, with its jade-like silky texture, extremely fine and dense grain, subtle and deep lustre, was the favoured timber of the Ming and Qing Courts. Due to the size of beds and the scarcity of the material, zitan couch-beds are particularly rare. The revered material, thickly-rendered proportions and vast landscapes suggest that this bed would have graced the studio of an important male member of the imperial family. 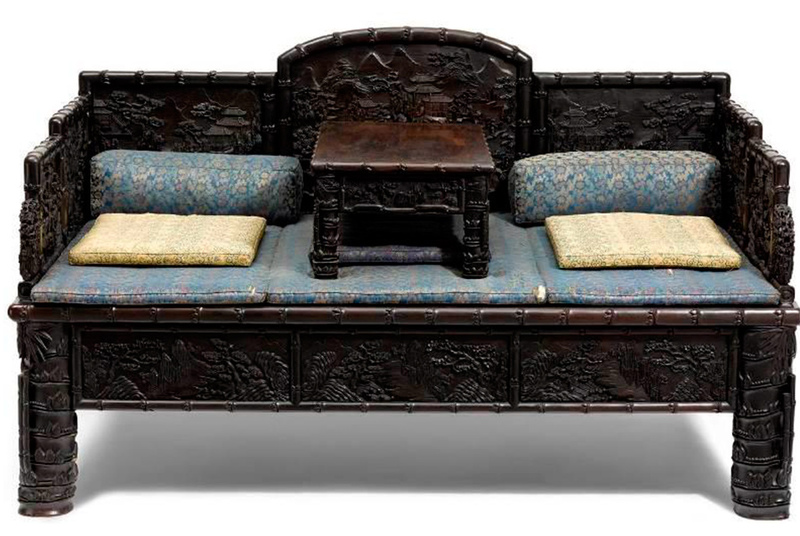 The vast landscapes and bamboo forms of this bed would have been appropriate for furnishing a studio as the scenes provided a form of escape from the duties of officialdom as well as serving as a means of inspiration for poems, paintings and meditations. During his 60-year reign, Qianlong distinguished himself with both civil and martial terms, as well as with an appreciation for cultural refinement and a love of literati life. As recorded in the Shiqu baoji xubian, the Qianlong Emperor painted this scroll of “autumn mountains in mist, with a lone gazebo by the water” during New Year in 1746 in the Chonghua Gong (“Palace of Double Brilliance”). Opening with layered peaks and the beautiful scenery along the facing banks of a river, the scroll continues with a riverside gazebo drawn in minimalist brushwork, with trees and rocks rendered in an impressionistic xieyi style. Intricately carved with the “three friends of winter”, the headpiece of the current ruyi sceptre is abundant with pine, and prunus is interspersed with bamboo on the shaft. As a work of art, it is finely executed, poetically elegant, yet naturalistically modelled. During the Yongzheng and Qianlong periods, the court had a great fondness for such naturalistically carved ruyi sceptres. Incised with a date denoting the first year of Qianlong period and an additional single character jin (“entrance” or “advance”), the current scepter is a rare example made shortly after the Emperor ascended the throne. This cup is notable for the skilful use of underglaze blue. Porcelain decorated in the doucai technique generally consisted of enamelling within pencilled underglaze blue lines; however the craftsman of the present cup has also expertly applied layers of cobalt to give texture and added three-dimensionality, as seen in the bodies of the birds (pictured above right). This style of decoration reflects the simple yet elegant style favoured by the Yongzheng emperor. Striking for its elegant shape and carved decoration which emerges under a cool celadon glaze, this vase draws on celebrated porcelain traditions and reinterprets them to result in a rare and engaging piece. The form and decoration appear to have derived from early Ming moonflasks (bianhu) painted with flower scrolls in underglaze blue which were revived during the Yongzheng reign and continued into the Qianlong period. The crisp celadon glaze further reveals the Qianlong emperor’s admiration of Longquan celadon wares of the Song period and his encouragement of innovative approaches towards celadon glazes. 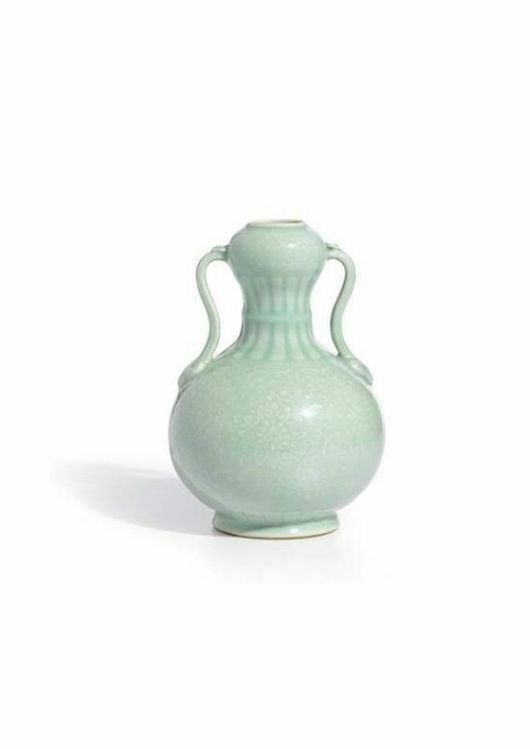 Among those most admired by contemporary connoisseurs is the present fengqing, a pale bluish-green glaze. When applied to finely carved pieces, the thinning and pooling of the glaze on the raised lines and the recesses create very attractive contrasting tones as seen on the present piece. This piece originally belonged to an exclusive set of five brushpots, each inscribed with six poems. A second brushpot from this group can be seen in the National Palace Museum, Taipei. 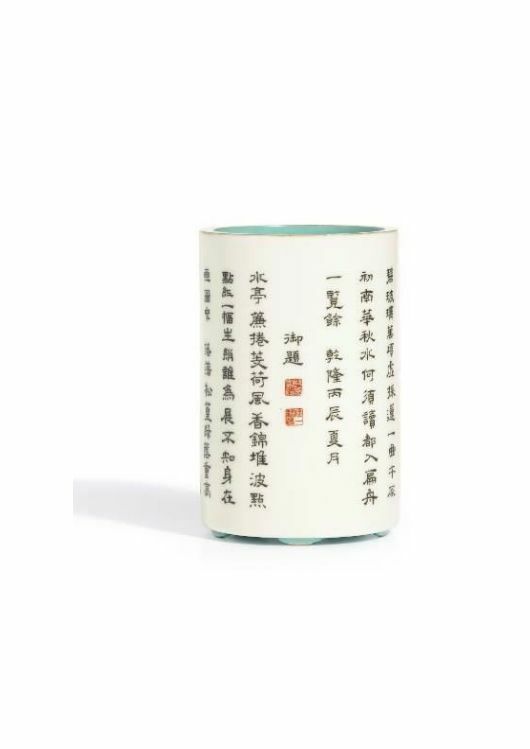 The poems on the present brushpot are the first six of a set of 30 composed by the Qianlong Emperor, dated from before his ascension to the throne in 1736. A famous painter of the early Qing dynasty, Yun Shouping (1633-90) ranks as one of the six masters of the early Qing, and is notable for his mogu (“boneless paintings”, colour paintings devoid of outlines) paintings of flowers. 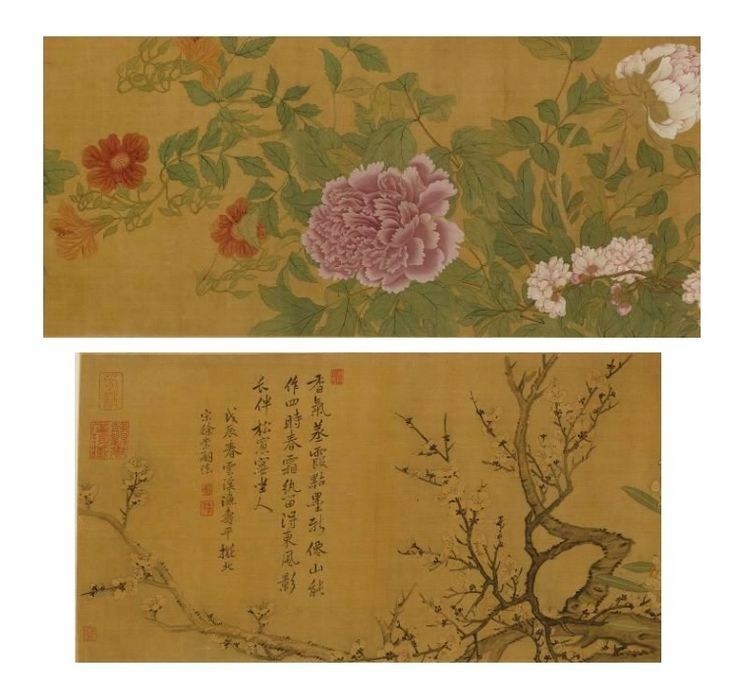 This scroll, executed in light colours in a realistic style, depicts a total of ten flowers, namely pear flower, peach blossom, tree peony (detailed right), red poppy, herbaceous peony, mallow, banana flower, chrysanthemum, narcissus and prunus (detailed below). The passage of time can be seen through the varying seasonal blooms. The quiet elegance of white pear blossoms gives in to peonies. Later come autumnal chrysanthemums in brilliant reds, whites, and purples, followed by narcissuses with their extraordinary subtle fragrance, and at last a finale of elegant prunus painted in pure ink. This naturalistically painted scroll was in the collection of Yunli (1697 – 1738), the 17th son of the Kangxi Emperor, and later in the collection of Fang Junyi (1815 – 89), a presented scholar, as well as knowledgeable connoisseur and astute collector.